Despite their reduced incomes, they said they’re satisfied with how they’re doing and agreed they “don’t need to spend as much” as they did before. About three out of four also reported being either somewhat or much better off financially than their parents. It’s important to note that these are recent retirees, and their financial strains may grow over the years as they deplete savings. Also, this group is somewhat better off financially than typical retirees; their median household assets – investments and home equity minus debts – were $473,000. The less wealthy may face even larger declines in their standard of living when they retire. And among boomers who haven’t yet retired, T. Rowe Price’s survey revealed deeper anxieties and lower expectations for their retirement than those who’ve already left the labor force. Some of the differences in how older workers and retirees understand retirement are quite striking. Slide 13 shows that older workers expect to receive a high percentage (31%) of their retirement income from defined contribution retirement plans, and retirees reporting that little of their income comes from that source. Slide 23 seems to show that older workers are generally more pessimistic than retirees about how secure they’ll be in retirement. I was also intrigued by slide 37. From slide 35, we know that this is a group of older workers who hope, on median, to have at least $700K at retirement. Yet just 34% plan to delay Social Security benefits until 70, a tactic that has been promoted (just from my reading) by CRR, J.P. Morgan and Prudential. You get the feeling that these mostly affluent workers still think “full retirement age” means something in reference to benefit levels. Like you’re giving something up if you claim benefits before then, but not gaining much if you claim after. Thanks for the link. The reporting of financial assets is a definitely higher than the dire reports we hear of the number of folks with less than $50k saved. Nobody these days can know everything, advisers included. Really points to importance of having a team to call upon when needed. One of the most neglected costs in planning is lifetime healthcare needs. Some questions on those expectations would be an interesting addition to the survey. When financial planners/retirement experts use 70% to 80% of pre-retirement income to project needed retirement savings/spending they are assuming that 100% of pre-retirement income is being is being spent pre-retirement. While this is undoubtedly true for some, many pre-retirees actually spend only 60%-70% of re-retirement income. 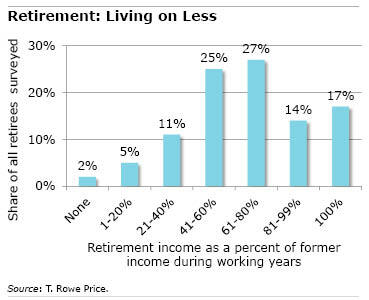 It should not be a surprise then that some retirees are living on less than 70% to 80% of pre-retirement income. They are not spending less in retirement, they are just spending what they always have. All the retirement readiness calculators assume a certain level of financial need. It may be retirees don’t need what they believe they need, which makes the assets they will have go farther. Retirement readiness maybe about a willingness to sacrifice years in retirement or retirement lifestyle. On the other hand, they don’t have to work. And many workers are living on less, too. Larry Chapman raises a good point. My husband and I live on significantly less than we make — all the extra goes into investments and to paying off the house. Our retirement budget (including taxes and health care) will only be 45% of our current income, yet our day-to-day spending will be the same as it always was. As an advisor with 20 years of experience working with middle class people, my experience is that people need far less to live off of in retirement than many policy makers and representatives of the financial services industry suggest. Of course, saving and planning is very wise. This is what I do everyday with my clients. However most people (not all, but most) have modified their lifestyle over the years to prepare for the later stages of their life. I have a very cynical viewpoint of how the financial services industry frightens people about their financial future. I have many clients that are doing fine with their Social Security and a little additional income. They have some funds saved up, but are nowhere near a million dollars and are living comfortable, modest lifestyles.